A few years back a client hired me to better organize his independent practice and create a business plan and marketing plan for growth. The first few coaching sessions went well. We were laying the foundation for the firm's change from chaotic to smoothly functioning machine. Then there were a few signs that the owner was not willing to take the actions and make the leap to a higher level of success. He would complain about his employees and then do nothing about changing their behavior. He would complain about the clients without sending them packing. Then he started showing up for his coaching sessions with no idea what he wanted to work on. I should have seen the writing on the wall when he told me months prior that he had dropped out of a high profile "coaching program" due to a busy schedule. So I said "Wouldn't the coaching program have taught you how to have a less busy schedule?" He said he just didn't have time to do any of the homework because he needed to be out meeting with clients. A few weeks later he emailed me that he just couldn't continue with the coaching because he was too busy. 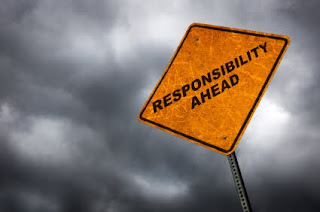 This client failed to take responsibility for implementing critical changes to his business which brings up an important point: You must take full responsibility for your financial success in order to make changes in your business and your life. You are independent. No one is standing over your shoulder forcing you to work. This is your business and it is your responsibility to work your business, provide value to prospects, and win new clients. You have no control over others, but you have control over what you decide to do with your time. Once you make the decision to GO FOR IT with your business, one of two things will happen. You will either sit there thinking about what you should be doing or you will start DOING what you should be doing. There's a switch in your brain that needs to go from passive to active. Once you are successful in turning on that switch you will skyrocket your success. You can't change others but you can change yourself. What do YOU need to change?